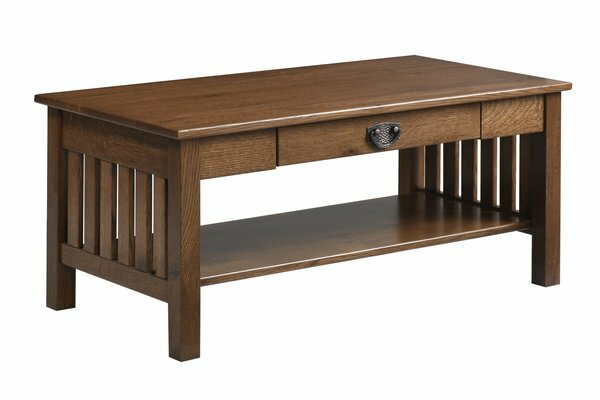 Functional and decorative, the Amish Liberty Mission Coffee Table takes center stage in your living room or den with grace and purpose. There's an open lower shelf for tucking magazines and a handy drawer for keeping the remote from getting lost in the sofa cushions. This custom coffee table is built by hand in the wood, finish and hardware you choose. The Amish Liberty Mission Coffee Table is shown here in rustic quarter sawn white oak wod with OCS110 Medium Finish. Amish coffee tables will last for generations. Find out what our customers are saying about their new Amish furniture on our Reviews page. Thanks for shopping with us today.